How can I show my friends a magic trick using pepper? Begin by filling the bowl with water. Then pour black pepper onto the water to form a thin layer of pepper across its surface. 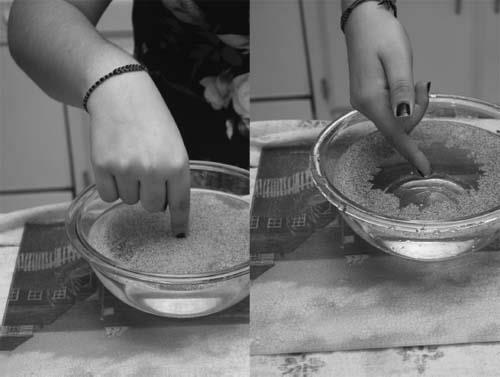 As a control experiment, try dipping your finger below the surface of the water. Nothing too interesting should happen at this time. Now rub a small amount of dishwashing soap on your finger and dip it in the water again. This time, you should see the pepper move away from your finger and toward the edges of the bowl. The non-polar soap molecules don’t want to dissolve beneath the surface of the water, and thus they spread across the surface of the water quickly, which lowers its surface tension. Whereas water typically bulges a bit above its surface due to its relatively high surface tension, the water spreads out when its surface tension is lowered. This causes the water to spread out as the soap moves over it, and the pepper is carried away from your finger in the process. Now that you understand the basics of this trick, you can perform it for your friends. Ask a friend to dip their finger in the water and to try to concentrate on trying to make the pepper move away from their finger. When they cannot make it happen, you can step in and use your (already soapy) finger to easily move the pepper away!